“Ancient astronauts” (or “ancient aliens”) refers to the pseudoscientific idea that intelligent extraterrestrial beings visited Earth and made contact with humans in antiquity and prehistoric times. Proponents suggest that this contact influenced the development of modern cultures, technologies, and religions. A common position is that deities from most, if not all, religions are extraterrestrial in origin, and that advanced technologies brought to Earth by ancient astronauts were interpreted as evidence of divine status by early humans. The idea that ancient astronauts existed is not taken seriously by academics, and has received no credible attention in peer reviewed studies. Well-known proponents in the latter half of the 20th century who have written numerous books or appear regularly in mass media include Erich von Däniken, Zecharia Sitchin, Robert K. G. Temple, Giorgio A. Tsoukalos and David Hatcher Childress. 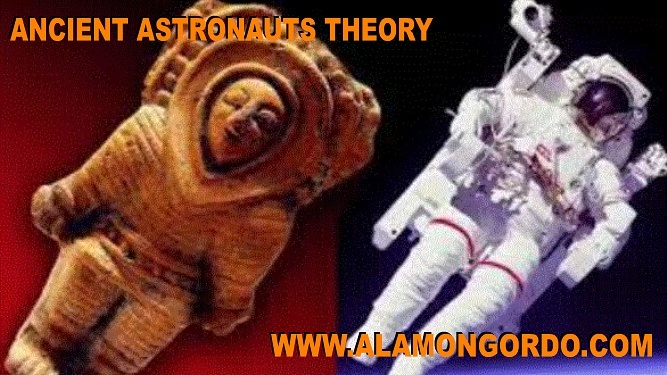 Proponents of the ancient astronaut hypotheses often maintain that humans are either descendants or creations of extraterrestrial intelligence (ETI) who landed on Earth thousands of years ago. An associated idea is that humans evolved independently, but that much of human knowledge, religion, and culture came from extraterrestrial visitors in ancient times, in that ancient astronauts acted as a “mother culture”. Some ancient astronaut proponents also believe that travelers from outer space, referred to as “astronauts” (or “spacemen”) built many of the structures on Earth (such as Egyptian pyramids and the Moai stone heads of Easter Island) or aided humans in building them. Proponents argue that the evidence for ancient astronauts comes from documentary gaps in historical and archaeological records, and they also maintain that absent or incomplete explanations of historical or archaeological data point to the existence of ancient astronauts. The evidence is argued to include archaeological artifacts that they deem anachronistic, or beyond the accepted technical capabilities of the historical cultures with which they are associated. These are sometimes referred to as “out-of-place artifacts”; and include artwork and legends which are interpreted in a modern sense as depicting extraterrestrial contact or technologies. Paleocontact or “ancient astronaut” narratives first appeared in the early science fiction of the late 19th to early 20th century. The idea was proposed in earnest by Harold T. Wilkins in 1954; it received some consideration as a serious hypothesis during the 1960s. Critics of the theory emerged throughout the 1970s, discrediting Von Daniken’s theory. Ufologists separated the idea from the UFO controversy. By the early 1980s little remaining support of the theory could be found. In their 1966 book Intelligent Life in the Universe, astrophysicists I. S. Shklovski and Carl Sagan devote a chapter to arguments that scientists and historians should seriously consider the possibility that extraterrestrial contact occurred during recorded history. However, Shklovski and Sagan stressed that these ideas were speculative and unproven. Shklovski and Sagan argued that sub-lightspeed interstellar travel by extraterrestrial life was a certainty when considering technologies that were established or feasible in the late 1960s; that repeated instances of extraterrestrial visitation to Earth were plausible; and that pre-scientific narratives can offer a potentially reliable means of describing contact with aliens. Sagan illustrates this hypothesis by citing the 1786 expedition of French explorer Jean-François de Galaup, comte de La Pérouse, which made the earliest first contact between European and Tlingit cultures. The contact story was preserved as an oral tradition by the preliterate Tlingit. Over a century after its occurrence it was then recorded by anthropologist George T. Emmons. Although it is framed in a Tlingit cultural and spiritual paradigm, the story remained an accurate telling of the 1786 encounter. Additionally, Shklovski and Sagan cited tales of Oannes, a fishlike being attributed with teaching agriculture, mathematics, and the arts to early Sumerians, as deserving closer scrutiny as a possible instance of paleocontact due to its consistency and detail. In his 1979 book Broca’s Brain, Sagan suggested that he and Shklovski might have inspired the wave of 1970s ancient astronaut books, expressing disapproval of “von Däniken and other uncritical writers” who seemingly built on these ideas not as guarded speculations but as “valid evidence of extraterrestrial contact.” Sagan argued that while many legends, artifacts, and purported out-of-place artifacts were cited in support of ancient astronaut hypotheses, “very few require more than passing mention” and could be easily explained with more conventional hypotheses. Sagan also reiterated his earlier conclusion that extraterrestrial visits to Earth were possible but unproven, and improbable. Erich von Däniken was a leading proponent of this hypothesis in the late 1960s and early 1970s, gaining a large audience through the 1968 publication of his best-selling book Chariots of the Gods? and its sequels. According to von Däniken, certain artifacts require a more sophisticated technological ability in their construction than that which was available to the ancient cultures who constructed them. Von Däniken maintains that these artifacts were constructed either directly by extraterrestrial visitors or by humans who learned the necessary knowledge from said visitors. These include Stonehenge, Pumapunku, the Moai of Easter Island, the Great Pyramid of Giza, and the ancient Baghdad electric batteries.